Click on a highlighted area below for low-resolution detailed maps. Full-size PDF maps are available under Documents. The Minnesota Department of Transportation constructed passing lanes and other safety improvements on Hwy 34 between Detroit Lakes and Akeley. This work is based on a 2003 Interregional Corridor Study. The project is funded by the Corridors of Commerce program authorized by the state legislature to help improve freight movement and mobility. Safety enhancements are also included. The comment period on the Draft Environmental Assessment Worksheet ran from Dec. 23, 2013 through Jan. 22, 2014. The document can be accessed by clicking here (28 MB PDF). The "Findings of Fact and Conclusions" for the EAW, including public comments and responses, can be access by clicking here (5 MB PDF). 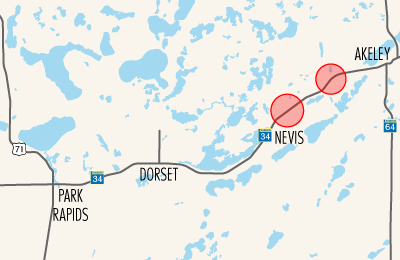 This project is located along rural stretches of roadway and does not include any ADA accommodations. However, the project will allow space for a possible Heartland Trail expansion from Park Rapids to Osage.